I think I actually gasped when I opened an email from Pat Sloan a couple of weeks ago to see an invitation to be a guest on her quilting podcast, American Patchwork & Quilting Talk Show. Pat is a designer, author, lecturer, and with her weekly radio show, is known as the "Voice of Quilting". 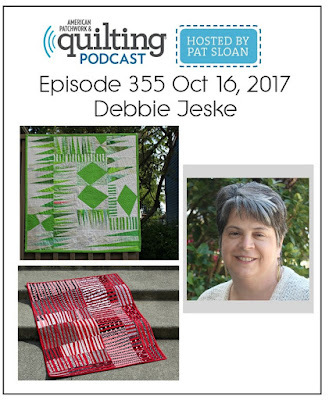 Over five years ago, she started the all-quilting podcast, during which she interviews quilt personalities, historians, designers and authors from around the world. How she tagged me to join her on the show, I'm not quite sure, but it should be fun to chat a bit about our favorite topic! Here is a handy guide on ways to listen. You can find recent past shows here, and if you are able to listen live, just click the 'Live on Air' button here. The podcast airs at 4 PM Eastern time and will be recorded and available afterwards in the show archives. Hope you can tune in! Wow, what an honor - although I'm not surprised at all Debbie. Looking forward to listening. So exciting!! Congrats to you!! What a fun opportunity, Debbie! you're fun to listen to. Congratulations! You are my improv quilt inspiration ! Cannot wait to hear your interview! I've never listened before, but now is a good time to start! I'm with Marci Girl. Have fun on the podcast! Have fun with your time talking to Pat. Everyone always has wisdom to impart...even to Pat Sloan. Have a great weekend! Well, I just downloaded the podcast from iTunes...congrats! How exciting for you and I'm anxious to hear the interview! Got it on my calendar! Enjoy your time with Pat - looking forward to hearing you. Oh, I hope you enjoy the experience! I just listened to the podcast and it was nice to hear your voice and listen to what you had to say. I especially liked the part about taking pictures to round up a project!